Wow! I knew that the Japan Meteorological Agency showed a big jump in October, and I expect GISS was doing some double and triple checking of the GISS data. October is the hottest October on record by a country mile. A whopping 1.04 °C above the 1951-1980 mean. This is the first time any month has an anomaly greater than 1 °C above the 1951-1980 mean (h/t Joe Stepansky). Every month since March, I've posted a chart of the progressive year-to-date global average surface temperature, from GISS. This is the update with October included. I'll repeat the explanation with each update and add what seem to be things to watch. 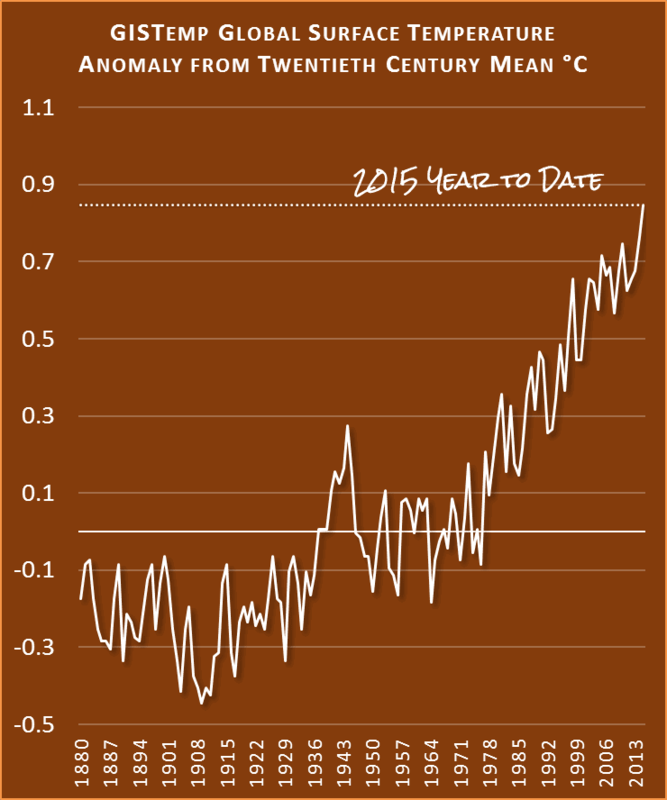 2015 is still hottest on record so far, and moving ahead of other years. The progressive year to date average up to and including October is 0.82 °C above the 1951-1980 mean, up from 0.81 °C to September. October was an average of 1.04 °C above the 1951-1980 mean and is the hottest October on record, after October last year (0.86 °C). June this year was the hottest June on record. The highest anomaly this year is now October, at 1.04 °C. The lowest anomalies this year so far were April, now 0.73 °C, and August now also 0.73 °C above the 1951-1980 mean. To drop below the hottest year on record, 2014 (0.75 °C), the average anomaly for the next three months would need to be around 0.41 °C, which seems almost impossible. Especially given the El Niño and the fact that the lowest anomaly so far this year was 0.73 °C. 2015 is tracking above all other years, and rising. The years to watch were 2014, 2010 and 2005. I've plotted them with slightly thicker lines so they stand out more easily. Below is the global mean surface temperature chart with 2015 the average to October, which is 0.85 °C above the twentieth century mean. I noticed that Tisdale is getting real nervous over at the place that shall remain nameless. It's not global warming, it's El Nino! Yes, Bob Tisdale has to use all sorts of averaging tricks to pretend that the mean temperature isn't close to the modeled. With this year's average to date, 2015 is only 0.03 °C below the CMIP5 mean - Bob uses "61 month smoothing" with HadCRUT, so he can claim there's a much greater difference. It's actually the PDO cooling off a bit in 2015 while waiting for the first sign of the El Nino making up the lost ground... all on the back of a very strong AGW signal. I've been predicting that the denialist community will scream "It doesn't count! It's El Niño!" for quite some time. You'll really start to hear it once the year is over and the media reports on us having just experienced the warmest year in well over a century. It doesn't matter that these charlatans have used the last big El Niño as their starting point for their "it hasn't warmed since 1998" lie for ages. And as soon as the current El Niño is done, they'll be back to telling us that "there's been no global warming since..."
I,'ve already met that point at Bishop Hill. Easily answered. 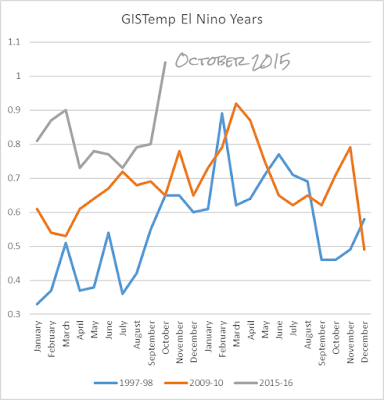 The best equivalent El Nino year for comparison with 2015 is 1997. In 18 years the anomaly temperature has risen from 0.48C to 0.82C, a rise of 0.34CCC If there ever was a pause, it is over. If there is now statistical significance in the difference between the global temperature during the 1998 El Niño and the currently fermenting one, one can ask the Denialati what the mean global temperature was 16-17 years ago, and what it is now. And then one can ask how much the temperature has increased (and it's done so with statistical significance, remember), and how that increase managed to occur if there was a 'pause' for the majority of the time since the 1998 El Niño. Are the Denialati going to say that all the warming occurred in the last few months of the currently forming El Niño? Good point, Bernard, and in fact one that Sou makes often as well. 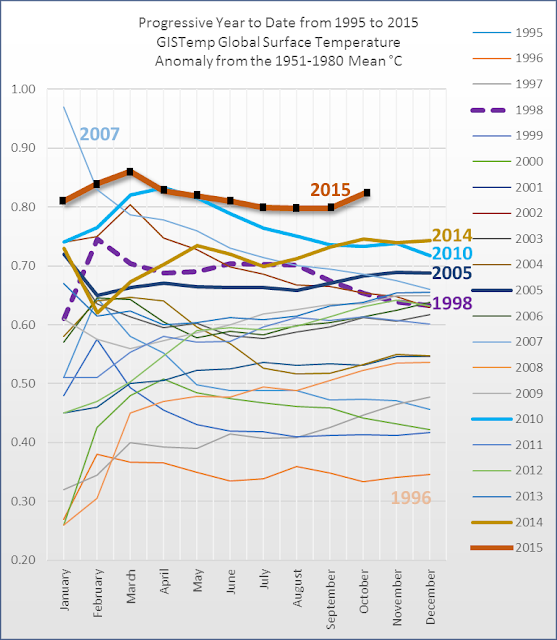 The GISTEMP Jan - Dec anomaly for 1997 was 0.48C, and for 2014 it was 0.74C. That's a 0.26C difference over 17 years, about 0.15C per decade. And both the 1997 and 2014 anomalies were the highest ever before their respective El Niños. Such a sharp uptick at the end of a running average is extraordinary indeed, and of course the signature of the latest El Niño is contained within. This doesn't preclude the fact that the planet is warming exactly as the science has predicted that it would. Of course the Denialati will now have the next "it hasn't warmed since..." landmark loaded and ready, but I suspect that even they will know in their bowels that they're speaking the contents thereof. What will be telling is how the Paris talks delgates respond. It's really the last reasonable chance to grasp the nettle and do something before the train-wreck is completely unstoppable. Responding to climate change is like parachuting. There's a safe altitude ceiling/ time mark prior to which a gentle landing can be made. We've passed that (about 15-20 years ago). There's a bit of height/time where the reserve 'chute/emergency measures can be deployed, and we're sailing past that point right now. If the 'chute/response is not fully engaged now, there's a small window left where there might be survival with a whole lot of being banged-up, but should that last chance be squandered all that is left is to watch the ground/future come barreling toward you and regret your folly. Humanity seems to want to emulate the fool who reached two metres above the ground and said "no worries, I can jump from here". With COP21 starting in just a couple of weeks, October data is probably the latest they'll see for surface temperature before the end of their meeting on 11 December. They'll get lower troposphere for November, but not the surface temperature anomalies. I've added an update of a chart showing how this year compares with previous El Nino years - for global mean surface temperature. I had to extend the axis to fit October. If the current El Niño follows a similar pattern to the last two, the anomaly may top 1.20-1.25 °C early next year. What were the Denialati saying about a pause? for me, we begin to have societal disruption, we don't even need one finger to count. See what happened in Syria, see the ripples going through Europe. And this is only the beginning - according to projections, even if Syria manages to get out of war and rebuilds efficiently its crop production will be halved. Even if Syrians get out of their current hell they will fall into another. So basically there's been no warming at all since sometime around the middle of this month. All that's left is to see how Monckton will hammer this final nail in the coffin of global warming. Is there any sign of this in the satellite records? I've tried to find something like this kind of update and what I see doesn't seem to show significant warming. If they don't there has to be something wrong with them I would think. Read the update and follow the link to see the pattern in global mean lower troposphere temperature anomalies. In past El Niño years, the lower troposphere anomalies didn't start rising until around December, peaking between January and April the following year. The lower troposphere amplifies highs and lows seen at the surface as well as lagging them somewhat (ENSO events, volcanic cooling). so you can expect a fairly big jump at that stage. October 2015 was record warmest in UAH (v6.0) and second warmest in RSS. Jan - Oct 2015 is warmer on average in both satellite data sets than it was in the corresponding period for the previous 2 big El Ninos. Going by Sue's charts in the link, we could be seeing the start of a new LT temperature record. If so, a bad look indeed for the fakes. unfortunately the satellite records will have to spike above 1998 before a few diehard skeptics will admit we've warmed past 1998 levels. Currently a lot of them are citing "NOAA adjustments" as a blanket excuse for dismissing what is happening in the ocean and land records. Thanks folks. I agree aaaaa they won't quit this meme until it goes above 1998. But it does make me laugh that a person can look at that record and how absurdly (Not disputing the data just the look) 1998 sticks out from the rest and they treat it as gospel truth instead of with any kind of scepticism. Of course why would I expect that. "Hottest October on Record by 0.18 °C"
It's hottest, but not by that much. The previous hottest was January 2007, at 0.97°C. Yes, that Jan 2007 anomaly was was quite phenomenal. It's probably fair to say, though, that it was more of an outlier in comparison with the other months in 2006 and 2007 - than October will turn out to be, given the El Nino. I expect October would be somewhat hotter in actual temperature (not anomaly) too, wouldn't it? Sorry, I misread - I was talking about hottest month on record, but you clearly said "hottest October". Yes, October was probably hotter than Jan 2007 absolutely, by a greater margin than anomaly. But I think that is rather artificial. The annual cycle of absolute temperature is built into the averaging method, and doesn't add any information about warming. But if only our friends over at WUWT didn't suffer from bouts of recurring amnesia they should be very happy. The stronger the El Nino the longer the next imaginary pause they can prattle on about. This from a very early model that we know exhibited a climate sensitivity higher than our current best estimate. Erm, scenario B assumes "a reduced linear growth of trace gases" However, our CO2 emissions have followed the "business as usual" scenario A pathway. And temps certainly ain't following scenario A! Actually I think Hansen considered scenario B as the most likely scenario. ...so Tamino has basically admitted that the climate forcings are much lower than Hysterical Hansen believed they were. It's good to know that Hansen got it completely wrong. I'm happy with that and I hope you are too. Well, it's 25 years later and that prediction is looking pretty dud, isn't it? Anybody want to come and defend Hansen? I could do with more of a good laugh. David Smith, the scenarios were based on different greenhouse paths. You've just admitted that greenhouse gases followed the scenario B path. So you shouldn't be comparing the temperature path with scenario A. Part of the reason emissions followed the scenario B path and not A is that the Montreal protocol phased out CFC emissions. CFCs being greenhouse gases. "The West Side Highway [which runs along the Hudson River] will be under water"
"so Tamino has basically admitted that the climate forcings are much lower than Hysterical Hansen believed they were." You know who got it wrong? The troll Richard Lindzen, who couldn't figure out that the QBO cycles match exactly to the lunar tidal forcings. And he had over 50 years to work at it. Hansen is brilliant compared to the putz Lindzen. They are now both retired but Hansen will go down as one of the greats, while Lindzen will go the way of the Thomas Golds and other cranks of science. If it wasn't for Lindzen, Curry, Spencer and these other people with a chip on their shoulder and matching contrarian streak, climate science would have actually progressed much faster than it has. "David Smith, the scenarios were based on different greenhouse paths. You've just admitted that greenhouse gases followed the scenario B path. So you shouldn't be comparing the temperature path with scenario A. Part of the reason emissions followed the scenario B path and not A is that the Montreal protocol phased out CFC emissions. CFCs being greenhouse gases." I'm not admitting any of that. I'm just saying that Tamino has admitted that Hansen got it hopelessly wrong. I'm fine with that. "Hansen will go down as one of the greats,"
Oh my, I've just had to wipe the tears from my eyes with laughing so much. Well, I have to go to bed now. Thanks for playing guys. Hansen's prediction for the Westside Highway was for 2028. That is confirmed in the book where the interview appeared. The cranks base their claim on "25 years" on a interview with the author where he misremembered the interview. Despite the author having corrected the record, the cranks refuse to correct their claim because they are not interested in the truth, only in point scoring. David Sanger's point is the one which David Smith needs to address. Go stand on the Westside Highway when amospheric CO2 has reach 560-570 ppm, and assess how much the sea level has risen. Even if the water is still halfway between pre-Industrial sea level and the top of the highway's centre-line, Hansen's fundamental point holds, because there will still be much more warming in train. Let's see David Smith make substantive points about actual, concrete physics-based landmarks in the emissions/warming trajectory. Not quite so alarming now is it? Why don't you come back when you've learnt to communicate like an adult? Honestly, it reads like you've just come in from the school playground. So I doubt you are spanking anybody's bottie - simply because you clearly don't have the wit to do it. Millicent, I did reply to your comment, but it seems to have disappeared. I do hope Miriam's not going all Stalinist with her moderation and disappearing 'inconvenient truths'. As for spanking botties, it seems to have got Miriam all hot and bothered! Yes dear you are really really all grown up. And if not you have an older brother who can beat us all up. Seriously, if you want to pretend that you know better than every prestigious scientific body on this planet then you need to start by at least managing to sound like an adult. And you still have not done that yet. I can see you're getting rather hot under the collar. Calm down dear! My word, you thermageddonists are easy to wind up. "How different it is now. The giants no longer walk the earth, and the money flood has become the raison d’être of much physics research, the vital sustenance of much more, and it provides the support for untold numbers of professional jobs. For reasons that will soon become clear my former pride at being an APS Fellow all these years has been turned into shame, and I am forced, with no pleasure at all, to offer you my resignation from the Society." "It is of course, the global warming scam, with the (literally) trillions of dollars driving it, that has corrupted so many scientists, and has carried APS before it like a rogue wave. It is the greatest and most successful pseudoscientific fraud I have seen in my long life as a physicist. Anyone who has the faintest doubt that this is so should force himself to read the ClimateGate documents, which lay it bare. (Montford’s book organizes the facts very well.) I don’t believe that any real physicist, nay scientist, can read that stuff without revulsion. I would almost make that revulsion a definition of the word scientist." "The appallingly tendentious APS statement on Climate Change was apparently written in a hurry by a few people over lunch, and is certainly not representative of the talents of APS members as I have long known them. So a few of us petitioned the Council to reconsider it. One of the outstanding marks of (in)distinction in the Statement was the poison word incontrovertible, which describes few items in physics, certainly not this one. In response APS appointed a secret committee that never met, never troubled to speak to any skeptics, yet endorsed the Statement in its entirety"
"This scheming at APS HQ is so bizarre that there cannot be a simple explanation for it. Some have held that the physicists of today are not as smart as they used to be, but I don’t think that is an issue. I think it is the money, exactly what Eisenhower warned about a half-century ago. There are indeed trillions of dollars involved, to say nothing of the fame and glory (and frequent trips to exotic islands) that go with being a member of the club. Your own Physics Department (of which you are chairman) would lose millions a year if the global warming bubble burst." I think that's enough to show you how you can't always rely on what a scientific body has to say. Science doesn't work by consensus. Is that adult enough for you Millicent? I'm going to be using that page a lot in future. Thank you. The quietness of the ice-age-cometh sun during this jump in global temperatures is rarely mentioned by skeptics anymore. PS: If you are a US citizen ... it's called irony. "The best we have is that models are tracking below global temperature, suggesting the models exaggerate the warming." So the models are wrong. Gotcha. Come on aaaaa, this is too easy! "Is that adult enough for you Millicent?" No David, you still sound like an immature little prick. I am going to break a rule, and I will debate you on your own level. Otherwise, go play with your lego bricks. Yes aaaa that is a lot flatter. And I'm still not getting my knickers in a twist. I love a bit of irony. It keeps the creases in my shirts. Come on aaaa, try harder! Sorry David, this is debating you on your own level. Or have you forgotten your post at 7.40? Are you an amnesiac too as well as hopelessly immature? Now go find the link dear. David, you say the models are wrong. So what? 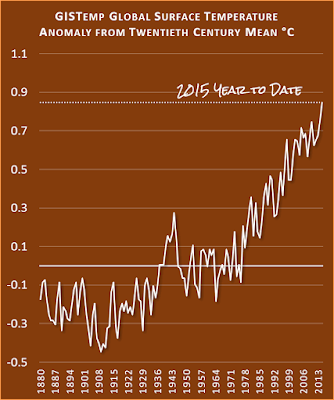 The Earth is still getting warmer. I guess, judging by your bedtime, you are British. Mild for the time of year, isn't it? "I can see that I've pressed all the right buttons. Mission accomplished!" It appears that David Smith understands his target demographic quite well. His fantasy about bottom smacking suggests he is most likely an English Tory. David, you do realize that "denialdepot" is a satirical look at stupid arguments, don't you? And as for Lewis, he apparently didn't have any particular expertise in climate science, but in his late 80s he decided that things had gone to hell in a handbasket, and all them young whippersnappers were up to no good. Color me unimpressed. This is "emeritus syndrome" in its purest form. Dragging out the old pet physicist again? That is a pathetic little blog. I would not bother clicking on the link Millicent. The immature misogynist is just trying to get his hit rate up. Did he whip his "thing" out? All that typing by David, destined only for the Hot Whopper bin. In the main I couldn't be bothered. His comments show him to be ill-mannered, undereducated, sexist, ageist and vulgar. I posted just one of them at the HotWhoppery. for the record. He won't be back here. Ugh. What a piece of work. Trolls are ugly. The warming rate due to CO2 has not paused at all. 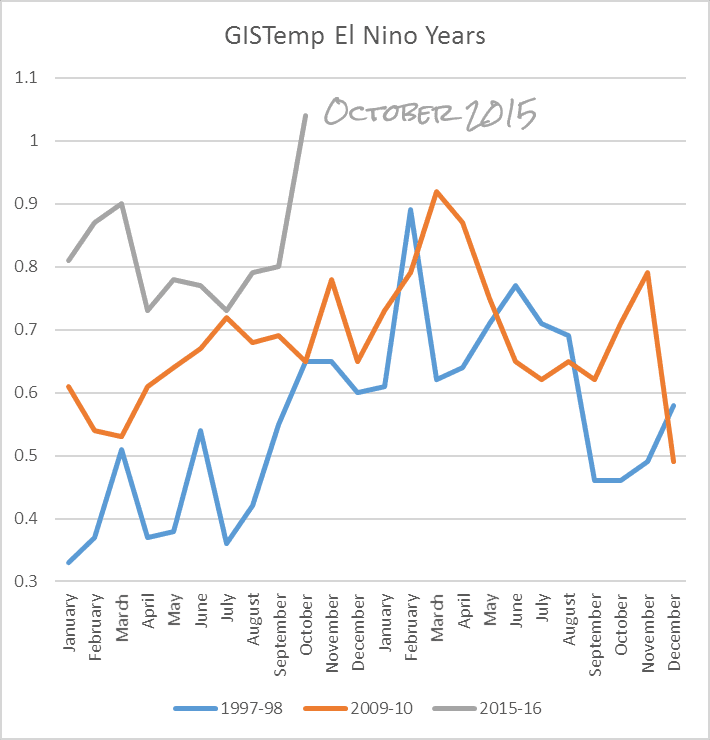 This graph shows El Nino, La Nina and neutral years all showing the same gradient. Readers might dismiss David Smith as just another of the vulgar, immature, loutish, misogynist wannabe bullies who hang around climate conspiracy blogs. However he claims to teach (his version) of science and maths to secondary school children. That may or may not be the case. Pretty well everything else he writes is wrong so there's no reason to believe him on that score either. However, if it is true, he has managed to con his employer and could be doing harm (not just from a learning perspective, or from his bullying tendencies shown here - harm to young women as well, either directly or through passing on his misogynist attitudes to boys). As MikeH says, his bottom-smacking fetish suggests he is not unfamiliar with the unsavoury aspects of upper/upper middle class of British society - the elitist all male school fag variety. On the other hand, children in secondary school are quite canny at seeing through their teachers. I'd guess that most would despise him, so he's probably not doing as much harm as all that. The fact that David dismisses and misrepresents one of the world's leading climate scientists, without understanding a word that he's written, is sufficient to dismiss all his comments, including his claim of teaching in a secondary school. A world in which warming reaches 4°C above preindustriallevels (hereafter referred to as a 4°C world), would be one of unprecedented heat waves, severe drought, and major floods in many regions, with serious impacts on human systems, ecosystems, and associated services. David has also shown he doesn't give a damn about people, not caring if sea level rises a metre or more this century, even though he's been told that will mean that between 140 and 220 million people live on land that would be below sea level by the end of the century, and three times that number may be affected. Countless more would be harmed and killed by storm surges. My apologies to everybody, especially Sou, for descending to his level. To paraphrase a line from Frasier: in my defence, I'm a lot worse in real life. David Smith is a science teacher! Really. One of the professional standards is to know science and teach the curriculum. He will be letting the children down if he teaches them the wrong science. I recall Christopher Booker getting in a snit when a parent told him his son had said climate science was wrong as an answer to an exam question. Since the question was very clear about what was required, that boy made a big mistake. Booker was just as bad to support it. Smith must know he isn't teaching for himself but for the children's futures. He makes me ashamed. We only have David Smith's word for that, Catmando, and his word is wholly unreliable in every other respect. If he is, since he says it's a secondary school, I expect his students are wise to him. Sou, you're right that I shouldn't take him at his word. You are also right that his students will see through him. Teenagers are smart like that (even if we don't enjoy everything they say or do at times). Please, please dump that climate revisionist troll!